Dylan Hysen, Sam Quattro, and Delaney Stovall discuss the latest Steven Universe episode, “Nightmare Hospital”! Dylan Hysen and Sam Quattro look back on Miyazaki’s classic My Neighbor Totoro. Dylan Hysen, Delaney Stovall, and Brit Falcon discuss the latest episode of Gravity Falls, “The Last Mabelcorn”. Dylan Hysen and Sam Quattro look back on Steven Universe’s Season 1 episode “Rose’s Scabbard”. Note that since we recorded this podcast the return date for Steven Universe has been announced as September 10th. Dylan Hysen and Mel Moyer look back on Disney’s Frozen. Dylan Hysen and Delaney Stovall discuss the latest episode of Rick and Morty, “The Ricks Must Be Crazy”. Dylan Hysen and Delaney Stovall conclude their watch-through of Over the Garden Wall, discussing the last two episodes. Dylan Hysen and Delaney Stovall continue their watch-through of Over the Garden Wall, this time discussing episodes 7 and 8, and making their finale predictions. Dylan Hysen, Delaney Stovall, and Brit Falcon discuss the latest episode of Gravity Falls, “The Stanchurian Candidate”. 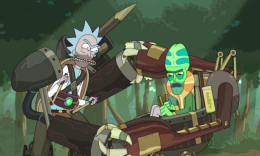 Dylan Hysen and Delaney Stovall discuss the latest episode of Rick and Morty, “Get Schwifty”.